Long gone are the days when football clubs were just involved with 90 minutes on a pitch during each game. Today, the clubs are brands – and that means that alongside playing they must focus on hospitality, events, sponsorship, retail and, of course, media. During the fairly recent past, many of the top names in the English Premier League, La Liga, Serie A and the Bundesliga have developed their own television channels as part of their media outreach. Some of those channels appear on the TV Guide of broadcasters, but others have opted to make their offering available via the Internet. One such football club is Arsenal Football Club (AFC). “Football clubs have had to become far more media savvy to enable them to reach and engage their millions’ of fans across the World,” states John Dollin, senior systems and operations manager, Arsenal Broadband Ltd – a 50/50 joint venture between AFC and KSE UK, Inc. Dollin, who admits to being an Arsenal fan himself, heads up a small group that takes care of the online and broadcast operations of the club. To achieve the goal (no pun intended) of the JV, Arsenal Broadband produce content for the website Arsenal.com, Arsenal Player (similar in operation to the BBC iPlayer, for example), the club’s YouTube channel, iTunes and various social media channels. The company also delivers content to 23 broadcasters around the world using Occasional Use (OU) satellite capacity. Dollin says that between 20,000 and 30,000 subscribers log on to the stream of their live match day show, which is broadcast over the Internet for home and away matches. The service is free – viewers simply need to register and create an account. The current subscriber base is circa 1.6 million. The green screen studio accommodates four locked off Sony EX3 cameras – three for discussions between presenters and one for a stand-up position, if needed. “The programme is fully scripted and we use teleprompters like the major broadcasters. Such is our desire for full professionalism,” emphasises Dollin. Audio is controlled from a Yamaha 01v96i console located next to the vision switcher. Although pictures of the game are the domain of the appropriate broadcaster, fans can listen to the Arsenal-centric commentary on Arsenal Player and via the Club’s mobile app. It is, therefore, feasible for fans to watch the game by ‘traditional’ television means, but listen to the dedicated commentary on their computer or similar device. Once the final whistle has blown, Arsenal Player will revert to dedicated video output that might include post-match interviews with players and opinions of the fans. The Arsenal Player team uses one of the flash rooms that have been set aside for interviews – although Dollin admits the broadcaster usually has first choice of the interviewees. 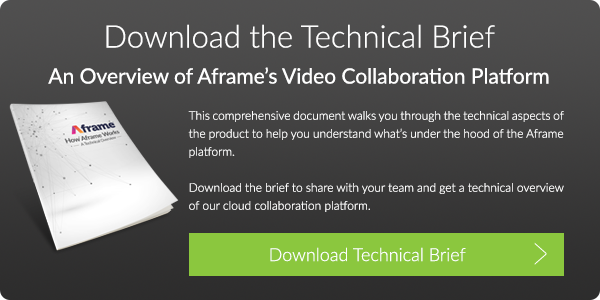 His search led to the deployment of Aframe – the cloud video collaboration platform that provides organisations with one central portal that allows all authorised users to view instantly, access and work with high-resolution media. “But the real magic is combining this system with Strawberry as the text written by the journalist and imported into Premiere becomes immediately searchable, reducing the onus on the editor to log their footage.” Strawberry is a Production Asset Management (PAM) system from German company Flavoursys. This PAM combines the latest project sharing and project management, meaning that editors should spend less time searching for content. It is rich in metadata and allows searches to be made word by word – which is ideal when you have hundreds of hours of content to log. To give you an idea of the scale, the Ision storage capacity at Arsenal is 240 Terabytes and they burn through well over a TB a month. Dollin says that the new workflow arrangement also means edited content can be sent to the cloud, with those that need to give approval able to check it on their iPhones or other devices.